Are you a Dr. Who fan? You do not have to be to love this little guy. 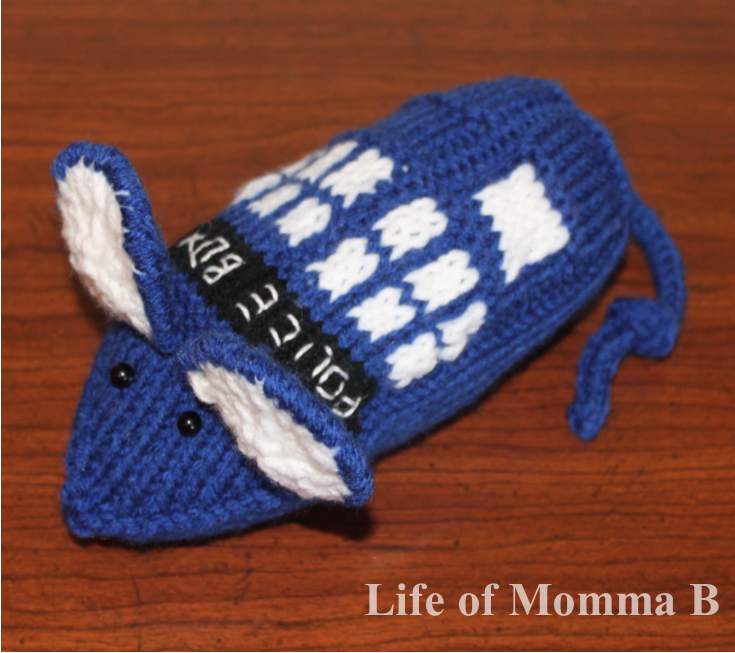 This mouse was inspired by the Police Box that Dr. Who travels in. It used a lot of color work and patience. I have to admit color work is still a chore for me. I still struggle with carrying my yarn and keeping the tension right. I embroidered the word “Police Box” onto its back and used 6mm beads for the eyes. The tail is a simple I-cord. The tail I knit was a little long so I added a knot in the end. If you would like to create this mouse, a copy of the free pattern by Kristen Howard can be found here. This entry was posted in Knitting and tagged Amigurumi, animal, beads, color work, i-cord, mouse, toy. Bookmark the permalink.